Each week for I don't know how long now, I've put 'smoothies' on our menu without ever mentioning how I make them, what I put in them, etc. 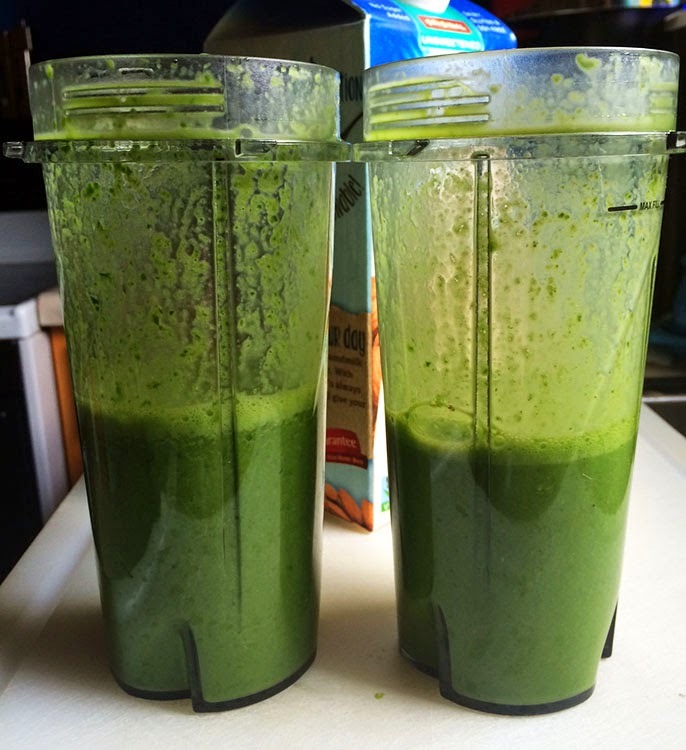 In general, they are a green smoothie but the color always ends up being a bit . . .unappetizing. One of last week's smoothies, in fact, prompted this tweet/Facebook status from me. I wasn't alone in this as I received several responses that some people often put their smoothies in non-see-through cups to drink them. Ha! Despite the look of the smoothies, we really enjoy them. 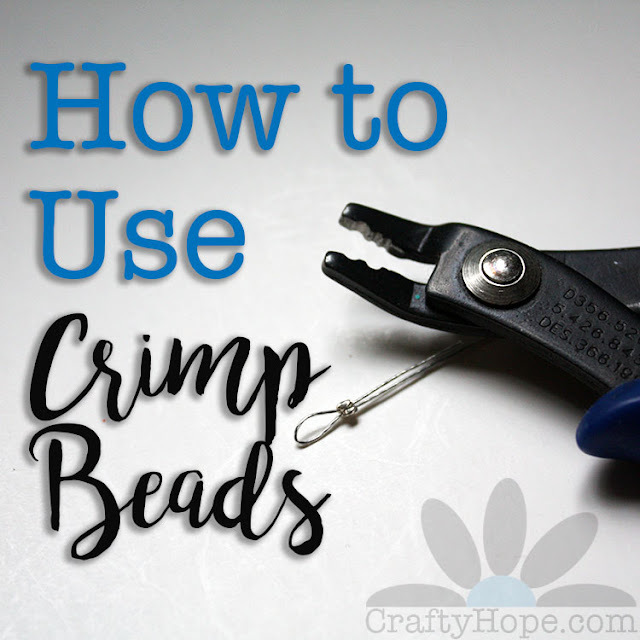 So here's how I generally make mine. 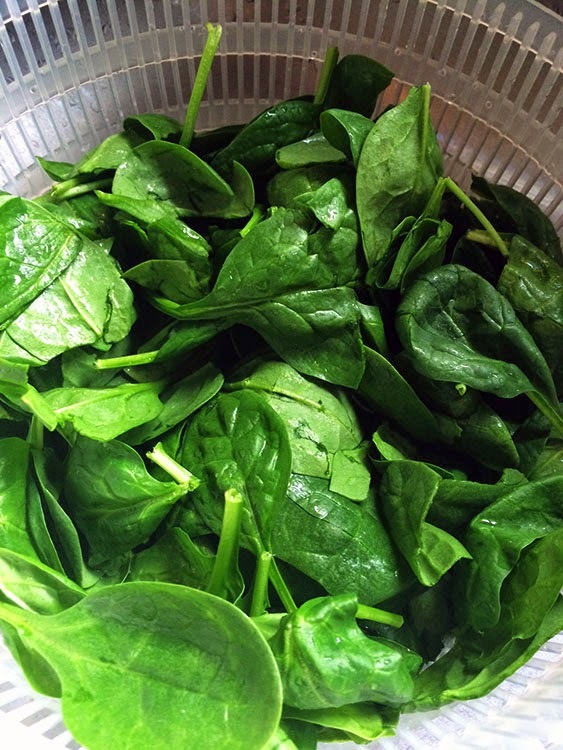 Throw the spinach in your blender/blender cups. 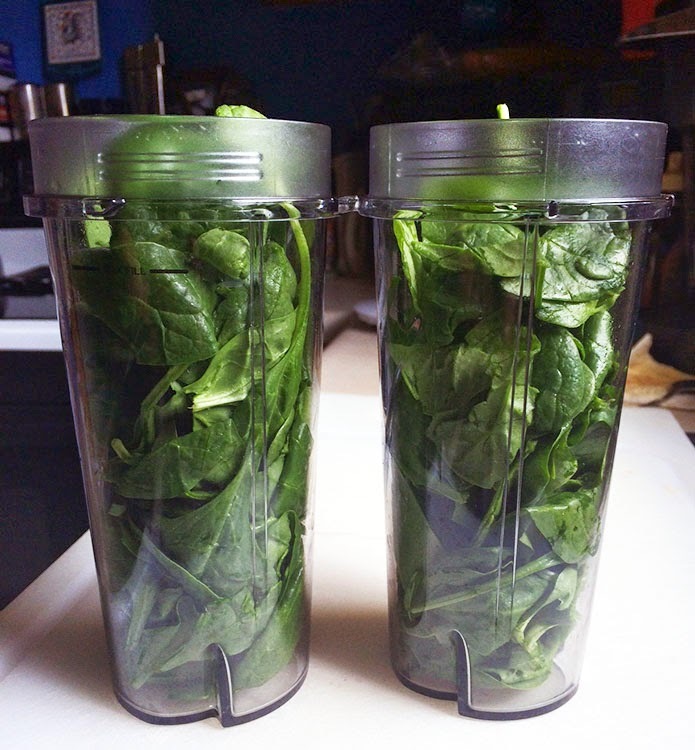 Above is about 2 cups of spinach per tumbler/person. Sometimes I just do 1 cup, but 2 is the max I can fit in these. Add your liquid. I almost always use unsweetened, unflavored almond milk. It's only 30 calories a cup and without a flavor so I can cook with it too (note: vanilla almond milk in mac-and-cheese is NOT GOOD). Anyway, you could use water or any other milk you have on hand if you want. I've got about 1/2 a cup in there. 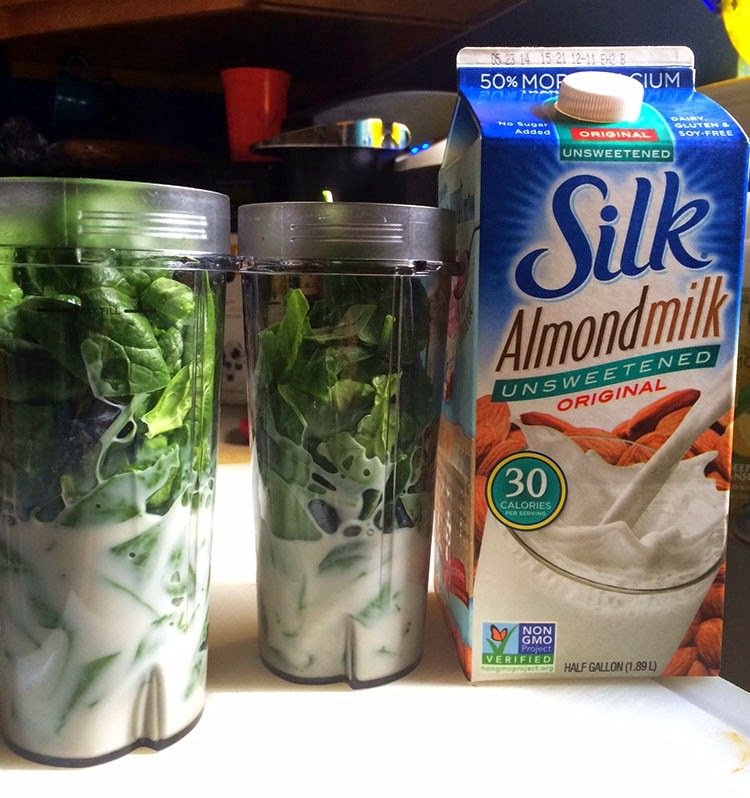 Blend the spinach/milk mixture until smooth. You see it blends down so you can add more yumminess. 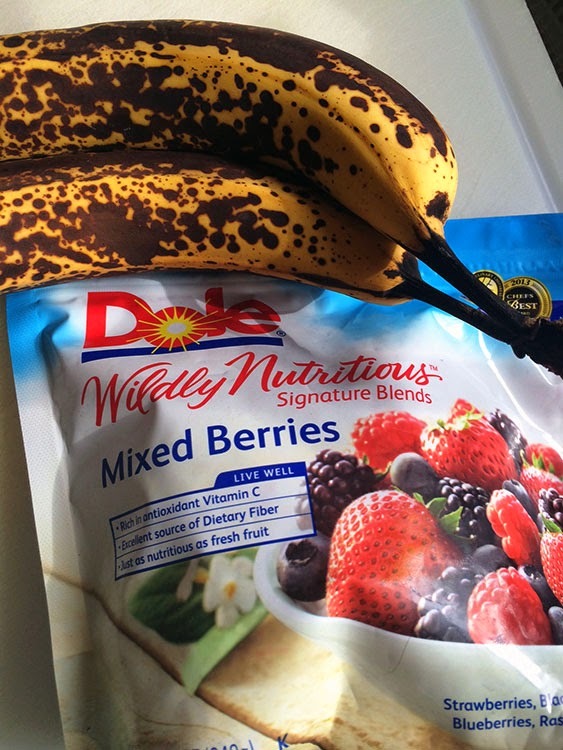 I always add 1/2 to 1 whole banana per person and then some frozen fruit, usually berries. I don't usually buy the packaged frozen fruit. Most often I get fresh fruit on sale and freeze it myself, but it's been a long winter and this is what I had on hand. Remember that if your fruit is frozen, you don't have to add ice. I also add about 1 Tbs of PB2. Y'all!! I haven't been paid or anything to represent this stuff, but I assure you it's awesome. The calorie and fat amounts for it are WAY BELOW traditional peanut butter, even the natural stuff. And, it still tastes like peanut butter. Score! 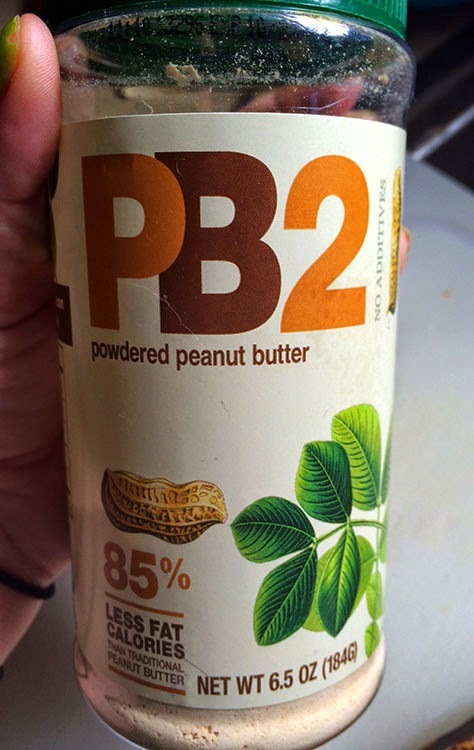 Apparently, there's even a chocolate PB2 version, but it's not in my local grocery store yet, dangit. Also, I try to make sure I add the powder between the bananas and the berries so it's touching the liquid and mixes well. 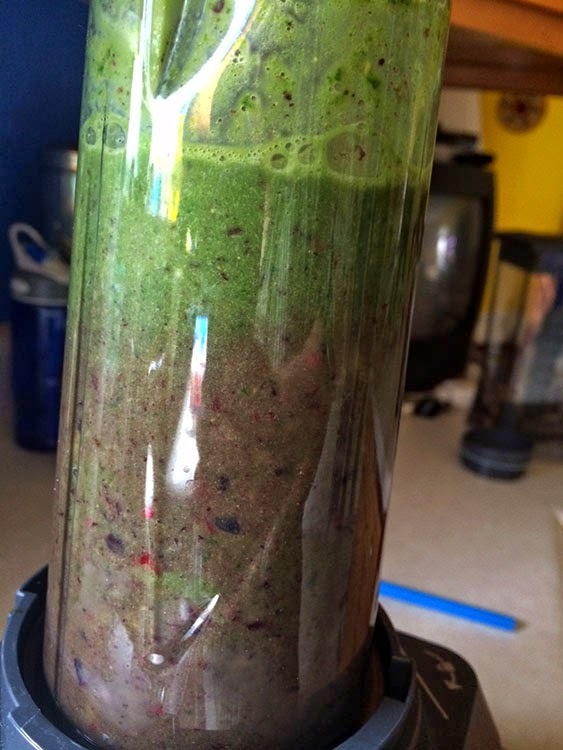 Then blend away, check out the berries mingling with the spinach. Alas, it still comes out that awful color. But, at least it tastes of a PB&J with banana! 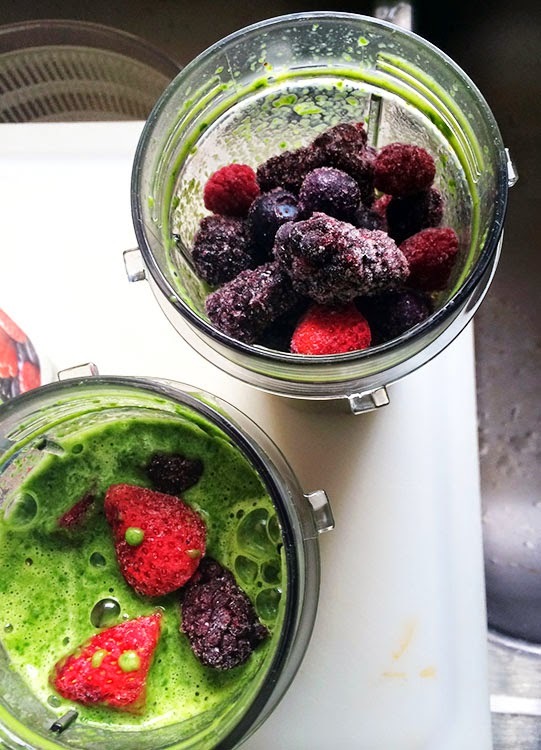 Now that I've shared my smoothie secrets with you, here's what's on the menu for this week. 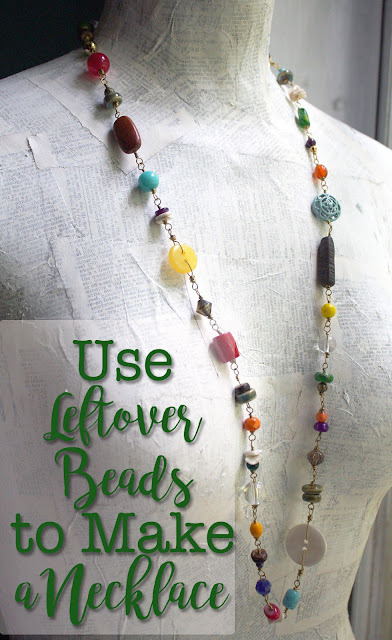 I'm linking up at I'm an Organizing Junkie's Menu Plan Monday. Broccoli, cannellini bean, and cheddar soup: I had such high hopes for this soup. However, once I started to cook the broccoli I realized there just wasn't much liquid to this recipe and there was A LOT of broccoli. I added more veg broth throughout the process, but it was still too think or something. The texture was mushy and not to our liking at all. I won't be making this again. So,what are you looking forward to eating this week? 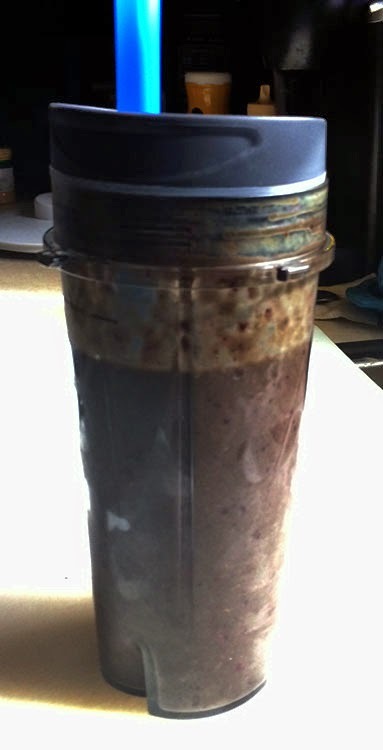 My smoothies are almost the exact same recipe, but I haven't used the powdered PB yet. I'm out of the habit of making them, so thanks for the reminder! *TeeHee* love the pointer about using an opaque container, Hope :) I also had never heard of powdered PB... what a concept! I would eat PB three meals a day if not for the calories (less bothered by the fat). Thanks for sharing your recipe!